Nitro’s Mystique Women’s Snowboard is that do it all, all mountain freestyle board that’s slightly directional. 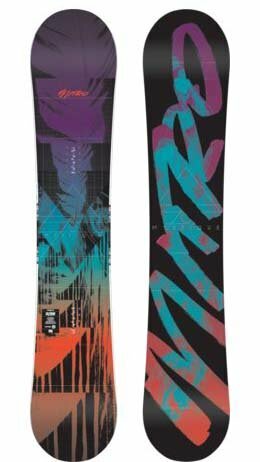 If you like hybrid rocker profiles and want a one quiver snowboard for your all mountain and park needs this one might interest you. I liked how playful and nimble it was, but at times it did feel slightly catchy from the aggressive camber outside of the bindings. But I was surprised at the edge hold it had on the hard snow, and thought it made for a pretty stable ride off-piste as well as on piste. Check the video below for more details. Approximate Weight: Feels normal to light on your feet. Flex/Buttering: The Mystique butters ok, you can feel the loos-ness right in between your feet where the rocker is, but you have to work a little more to get it all the way on the nose or tail. 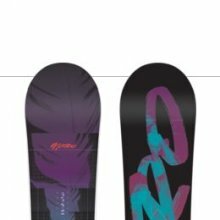 Nitro says it is a 4/10 but I felt my board was more of a 6/10, maybe it was just that specific board though who knows. 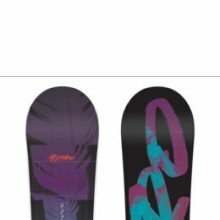 On Snow Feel: Feels pretty stable under foot, it is a bit loose flat base because of the rocker between the feet but not terrible. The camber outside the feet comes out quite a bit so you just have to be aware of where it is at. I didn’t notice it riding normal, but when I was riding switch and let my guard down I could feel it catch a little. Edge Hold: I found the edge hold to be really good on the Mystique, I rode over some hard pack and a little ice and it handled well, wasn’t able to test it on gnarly ice though. Turn Initiation: It is quick to turn, very easy edge to edge and nimble with the hybrid rocker profile. Turning Experience: Pretty fun and easy to turn, it is fairly easy to make skidded small to medium radius turns. Carving: Not my favorite to carve. You can get some smaller carves in, but you will have to work for the bigger arced turns if you want them. Speed: Holds speed well, not much chatter when you are cruising fast. Uneven Terrain: I found the Mystique to be pretty nimble in uneven snow, was able to maneuver through different situations pretty well. Powder: Would ride pretty well in powder with the directional nose on it, and the rocker in between the feet should help to lift the front of the board out of the snow. 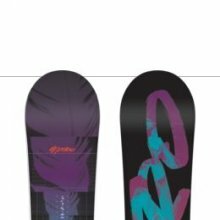 I think it is a little over half an inch set back on board and you could set back the bindings a little more as well, but I don’t think there is any early rise in the nose so I’m not sure how it would do on those super deep days. But should do fine on your average powder day without having to switch the snowboard out. Switch: Feels like a twin switch, you don’t notice the longer nose. 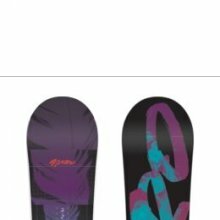 Jibbing: Didn’t get to test it out, but would probably jib fine, because the board I rode felt more on the stiffer side of medium, I don’t think it would be my favorite for jibbing but I think it would be good enough. Pipe: Would do ok in the pipe but I prefer a full camber or hybrid camber in the pipe, but I think it would be stable and you would be able to set your edge fine. Overall: I think the Nitro Mystique would be a good do it everything board for those hybrid rocker riders. It isn’t too aggressive for the riders still learning but can also be dynamic enough for the more advanced rider. 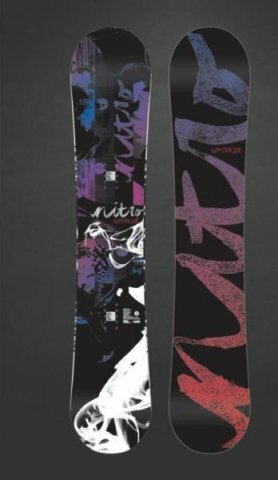 The Mystique has good edge hold for the hard snow days and is a directional twin so you don’t have to worry about a little fresh snow taking you down. It does well off-piste and would hold its own in the park as well. 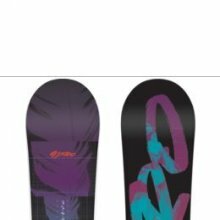 Would be a good do it all board at a decent price point. 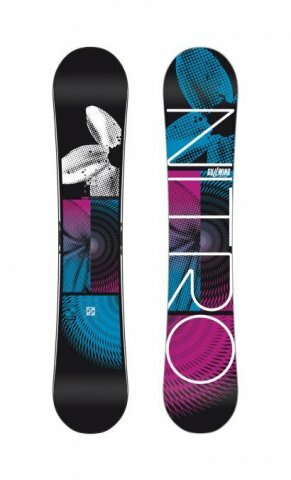 The Nitro Mystique has a rocker and side cut design very very similar to Never Summer. That makes this ride pretty good. We feel that never summer has a more sturdy long lasting board but this isn’t a bad choice. We feel this is right in between the Never Summer Pandora and the Never Summer Infinity. Its flex is slightly softer than the Infinity and the shape is closer to the Pandora. It’s not a bad choice if you are looking for a do anything freestyle all over the mountain type of ride. 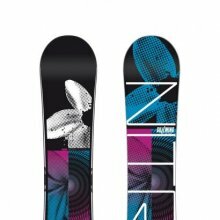 Groomers– Pretty good but nothing that made us say this is a great groomer board. It was fun for cruising the mountain at moderate speeds and taking a bit of a loose all mountain freestyle approach to riding. Powder: It provided a rather versatile powder ride that can accommodate a directional or centered stance ride in powder. We felt it was better for those who like to ride more with a centered stance that like to ride switch. It felt borderline great but the directional float was lacking compared to other boards we tried. Still its pretty easy to turn in the trees, good in tight chutes and fun on wide open slopes at moderate speeds. Turn Initiation and Carving: It’s borderline moderate and takes a little more work edge to edge than many hybrid rocker boards we tried. Wide turns are fine but it’s missing a little something on a carve we couldn’t put our finger on. There wasn’t a spring out of the turn like some hybrid shapes can offer similar to the feel of camber. Speed: We felt a little chatter and this is mainly a moderate speed board not made for bombing the hill. It can handle anything in the park and it’s terrible when on the mountain at high speeds. Weight– Feels sturdy but border line heavy just like Never Summer and Mervin Boards. Edge Hold: The Edge holds well and makes for a good all conditions ride. 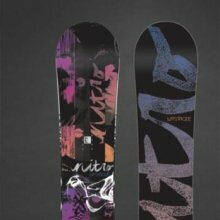 If you want to ride in anything from snowment to soft grippy snow the Mystique will do a good job. Like most boards, icy conditions will be a bit of a challenge but still, it’s great for most conditions you would want to ride in. Flex: The flex is on the softer side of medium but feels somewhat less than lively while not being damp. It’s more of an acquired taste and after a few runs we got used to the way the boards responds to you. Over a lot of time, you might even prefer this feel. It’s pretty easy to butter and press. Switch: When the stance is centered it’s pretty much like a true twin. 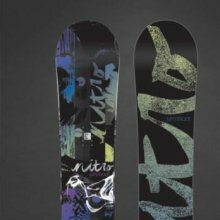 Rails/Jibs– This is a good sturdy board for the jib park and it can handle the abuse you get from there. It’s a little stiff for our taste to be a dedicated jib board but some will like this ride there. Pipe: Pretty fun wall to wall but missing something that would make it a great pipe board. It also has enough edge hold to be good in any condition. Jumps: It’s not dead by any means but it’s missing the snap that many boards of this shape have when it comes to good ollie power. Hitting the jumps in the park of any size is pretty fun and forgiving with the Gullwing but it’s missing something that makes it great. All in all the Mystique was one of those boards that offers a good ride everywhere but nothing great. Still it could be a good fit for someone that wants something in between the Never Summer Pandora and Infinity. We try to get as many images of the Nitro Mystique, but forgive us if they're not all there.